Last week, we received an email from a subscriber requesting they be removed from all mailings. They provided us with their explanation, which we are publishing along with our response. I will not support any private enterprise which promotes smoking, consider yourselves dumped with strong advice for others to stay-away from Warwick Valley Living, i will be speaking directly to all your current advertisers in the future to explain the other options available outside of your website & news forum, it was a poor choice to send today's newsletter as you did, i hope The Depo­t paid you well, for in the long run it is going to cost you big both in your image & your followers, so-long FOREVER! We are very sorry that you are leaving us “FOREVER.” That indeed is a very long time! I see you've been receiving our publication for some time and have never complained ­in the past about our editorial or advertising. Thus, we are surprised, shocked, and even saddened to learn of this most recent development. It came hard upon us, but we are slowly recovering and have finally gotten back on our feet after a week of self-examination. You should be aware that we pride ourselves on the content of our publication. We believe Warwick Valley Living provides a great service in terms of informing the community about events, promoting groundbreaking stories of notable local interest and of late, adding an online shopping component to our list of monumental achievements. But we try not to take ourselves too seriously, like our competition, the New York Times. When we get a 'thank you' from somebody who loves or appreciates a story, we are very grateful. Our advertisers represent a diverse set of businesses, which also, by the way, include those that promote healthy living. Personally Kerryl and I subscribe to a healthier lifestyle, drinking rather than smoking, so we understand your feelings about tobacco. Due to ethical reasons, I'm sure you don't visit CVS and other stores which sell cigarettes, and refrain from using places such as gas stations and convenience stores for the same reason. That might cause some problems for you in terms of transportation, but we understand. When it comes to sticking to one’s principles, you should be firm. 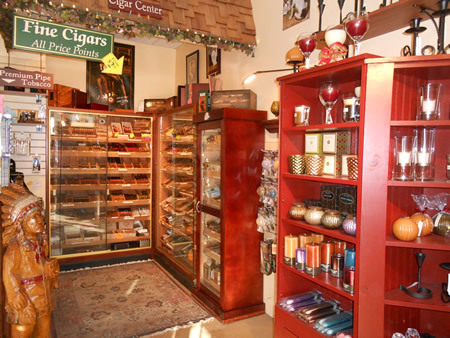 In defense of The Depot Cigar and Candle, located in Monroe, I’d like to say that it is a central hub where you can purchase Short Line tickets, quality candles, e-cigarettes and novelties, as well as cigars. Personally, my favorite reason for visiting is to kvetch with owner Jerry Fincke, who openly shares his views about Monroe politics, his knowledge of top-rated cigars (he has over a hundred brands), and his good humor on everything, helping us all pass the day more quickly. His wife is a tireless advocate against cigarettes, who counsels customers to switch to e-cigs or quit entirely. Their newsletter is even worth a smoke (I’m sorry to mention that), because once you start to inhale it, you begin to laugh and feel better about yourself and life. It is worth noting that he and his wife Cecelia have transformed a once run-down enterprise into a friendly, quaint, and warm environment. Recently their two dogs won first prize for best dressed (as participants in a pirate dog wedding) in the Monroe dog parade. Again we are sorry you took offense at our last newsletter. We take pride in our advertisers and the promotion that we provide. By the way, we did observe some anger in your tone. You should be aware that anger can be as toxic as tobacco and as hazardous to your health. Is Peace on Earth Possible?